Hey, don’t knock it ’til you try it. Peanut butter and pumpkin pair so well together, I promise! 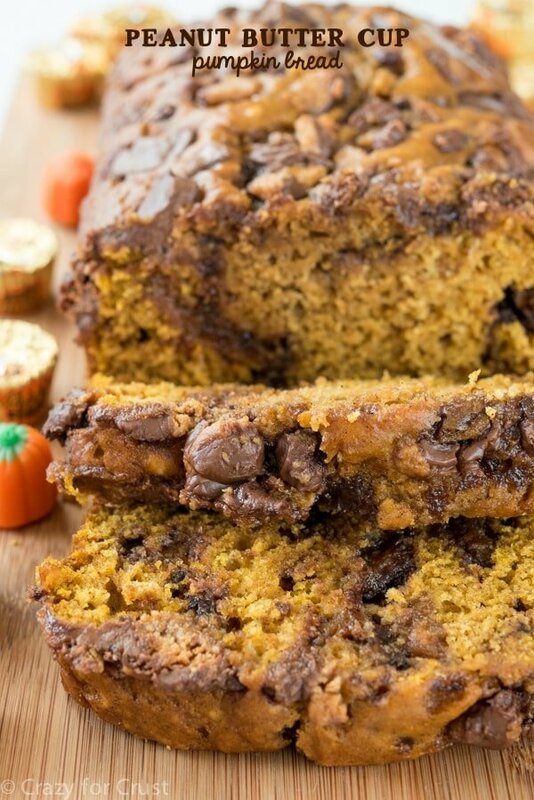 This Peanut Butter Cup Pumpkin Bread is your favorite pumpkin bread recipe with peanut butter cups inside! Can we talk for a minute about why Doogie Howser, MD is not available on Netflix or Amazon Prime? Like, it’s a travesty of epic proportions. An entire generation of people will never know the wonder of Dr. Doogie. We started watching Neil Patrick Harris’ new show, Best Time Ever. Except for a little commentary here and there, it’s a pretty family friendly show, so we let Jordan watch it. She loves it but has no idea who NPH is. He’s an American Icon, I told her. And he pretty much is, isn’t he? He’s a child actor who came out the other side unscathed, has had another hit show, and can do pretty much anything Hollywood throws at him. I was planning to start watching Doogie Howser with Jordan, both to introduce her to NPH’s amazing beginnings and also to relive my childhood fantasies of marrying him. I guess I need to start a Hulu subscription, which reminds me: why do I pay for regular TV again? Oh right, for NFL Network. This week I plan to introduce Jordan to my favorite TV doctor so she can realize the true wonder that is Neil Patrick Harris. And this is all happening while I introduce you to the wonder that is Peanut Butter Cup Pumpkin Bread. People don’t think peanut butter and pumpkin goes together. Guess what? Newsflash! It totally does. 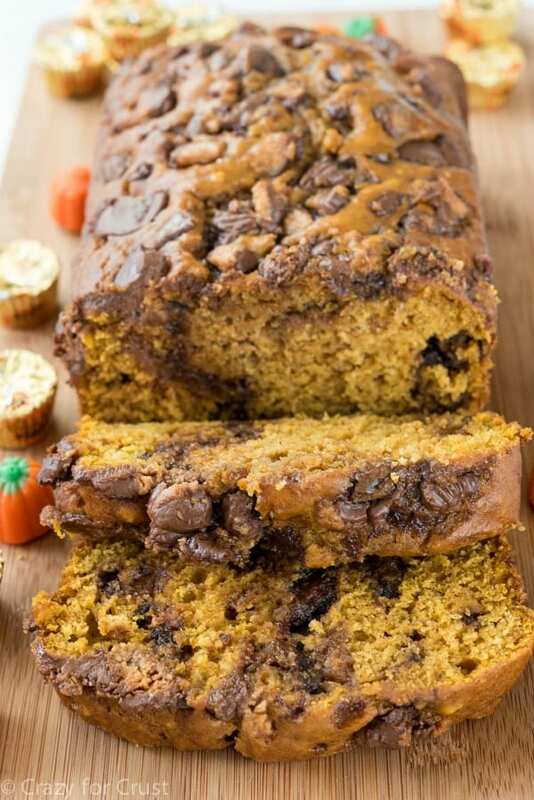 For this iteration of peanut butter + pumpkin, I decided to combine my favorite candy, Reese’s Peanut Butter Cups, with my favorite pumpkin bread recipe. The result? A bread that reminds you of fall…and your favorite candy. Peanut Butter and pumpkin go so well together, especially in a bread recipe, which is why I added peanut butter cups to my favorite pumpkin bread! 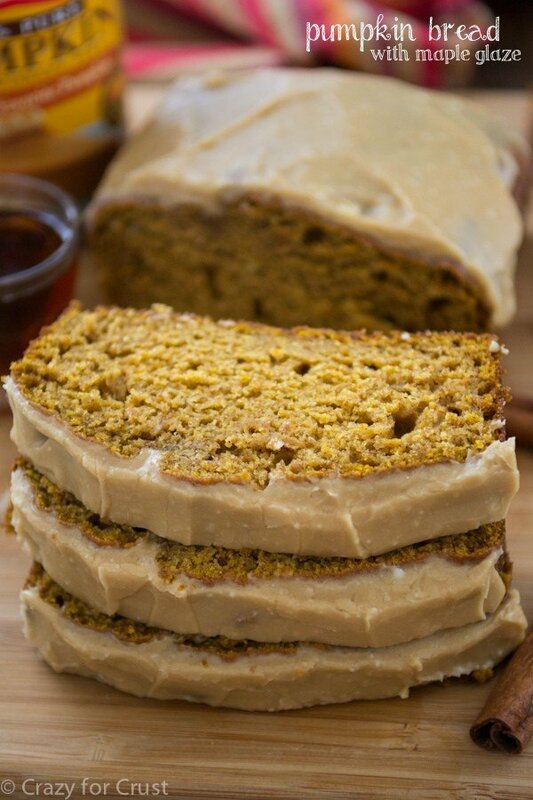 How do you keep pumpkin bread moist? This bread is so easy to make – it’s one bowl, one spoon, and you don’t even need a mixer. The use of vegetable oil keeps the bread moist, as does the pumpkin puree. And we all know that pumpkin puree doesn’t really add anything to recipes except it’s orange color, so the bread is full of pumpkin pie spice. Your entire house will smell like Thanksgiving! It’s important to note that this bread uses a combination of buttermilk and baking soda to give it it’s light and fluffy texture, much like in my mom’s banana bread. If you don’t have buttermilk you can substitute nonfat or whole milk, but add a teaspoon of white vinegar. This will give the recipe the acidity it needs to work it’s magic. The bread alone is perfect. You could do any number of things to the base bread recipe: add chocolate chips, toffee, nuts, caramel or frost it with cream cheese frosting. But my favorite thing to add to anything pumpkin is PEANUT BUTTER. Do pumpkin and peanut butter go together? Until Apple invents taste and smell technology for iTunes you’ll just have to believe me that this combo works. It’s a combination made in heaven. 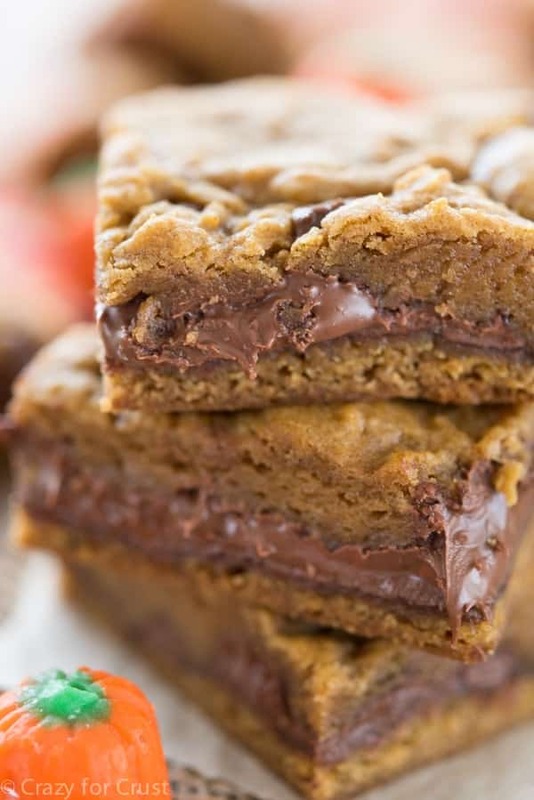 Simply chop up some peanut butter cups and add them inside and on top of this quick bread recipe. It makes a wonderful dessert or indulgent breakfast, or even a fantastic gift. May I dare to say…it’s the Best Bread Ever? 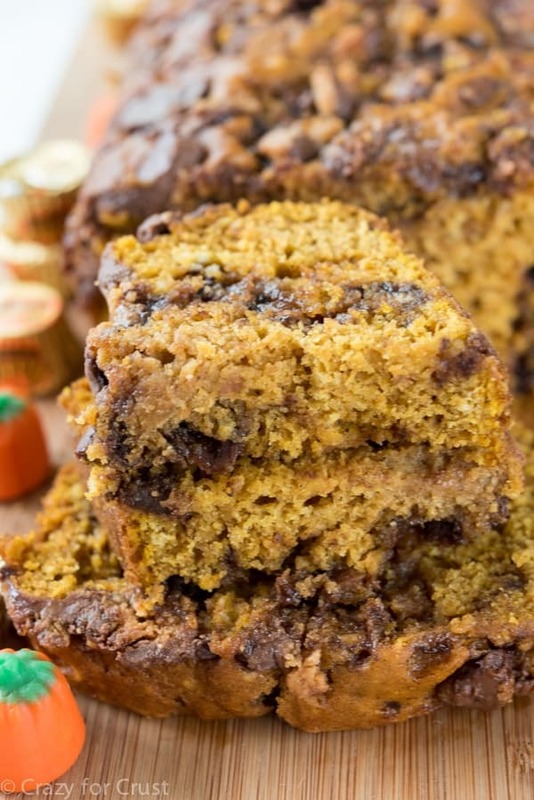 This Peanut Butter Cup Pumpkin Bread is so easy to make! One bowl, no mixer needed! 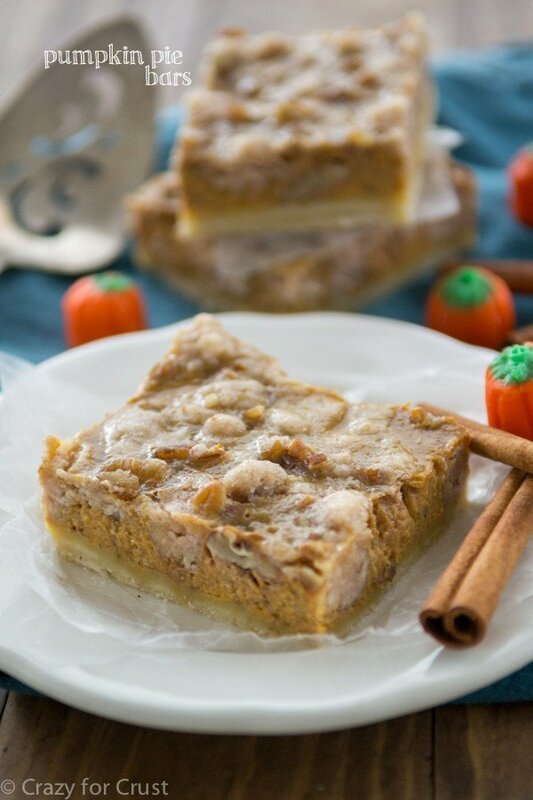 The combination of peanut butter and pumpkin is so good together - once you try it you'll fall in love with it! Preheat oven to 350°F. Spray a 9x5” loaf pan with cooking spray. Stir granulated sugar and brown sugar with oil and pumpkin. Stir in the eggs, pumpkin pie spice, salt, and baking soda. Stir until combined. Stir in buttermilk and flour just until combined. Fold in 1 cup of the chopped peanut butter cups. Pour batter into prepared pan. Sprinkle the remaining peanut butter cup chunks over the top of the bread. Bake for 40-45 minutes. If you want it totally done (no gooey center), test it by inserting a toothpick just partway into the top center of the bread. If this comes out clean, it’s done. If you like a gooier center, remove it when testing it with at toothpick that way comes out with a little stuck to the top. Let the bread cool before cutting. Store in an airtight container for up to 3 days or slice and freeze in individual sandwich bags. This combination sounds delicious, Dorothy! Adding Reese’s to this bread was just genius! I LOVED Dr. Doogie! That brings back memories for sure. THIS pumpkin bread. I bet the peanut butter cups go perfectly with the delicious pumpkin flavors. Looks fabulous! Okay, admittedly I’m not a Doogie Howser fan only because I never saw it. I know, I know.. maybe before my time just a tad? Either way, it’s so annoying that some classic shows aren’t available on Netflix! Must change that stat. Also? Loving this bread. You don’t have to tell me twice that PB and pumpkin are a match made in heaven! I need this in my life! It def looks like the best bread ever! And I know what you mean about Doogie. My much younger friends just know him as Barney from How I Met Your Mother. Straight up drooling right now. This looks AMAZING!!! Is this legal?! Haha, can’t wait to try this addition!